Every year the Buddhist leaders of Los Angeles, many of whom would never have met one another in Asia, come together for the springtime celebration of Vesak—the Birthday of the Buddha. 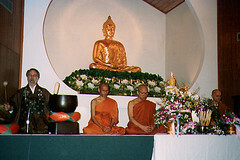 While the ceremony of bathing the baby Buddha with sweetened tea is primarily observed by Buddhists in East Asia, the Theravada monks and laity from South Asia here in the United States, in Los Angeles for instance, participate with pleasure and reverence, each taking the wooden dipper in hand, with a bow to the newborn Buddha. The monks are all members of the Sangha Council of Southern California. Such a “sangha council” is something relatively new in the long history of Buddhism. The Sangha Council began in 1980 under the leadership of a monk originally from Sri Lanka, Venerable Havanpola Ratanasara. Among its founding leaders were Venerable Do Ahn Kim of the Kwan Um Sa Korean Temple, Venerable Thich Thien-an of the first Vietnamese Buddhist Temple, Venerable Walpola Piyananda of the Dharma Vijaya Buddhist Vihara, Lama Geshe Gyeltsen of the Thubten Dargye Ling Tibetan Temple, and Reverend Masao Kodani of the Jodo Shinshu Senshin Buddhist Temple. The council brings together representatives from every major branch and school of the Buddhist tradition—monks from the Theravada traditions of Southern Asia, from the Mahayana traditions of East Asia, from the Vajrayana traditions of Tibet, and ministers from the Jodo Shinshu tradition which does not have monks but, rather, married clergy. 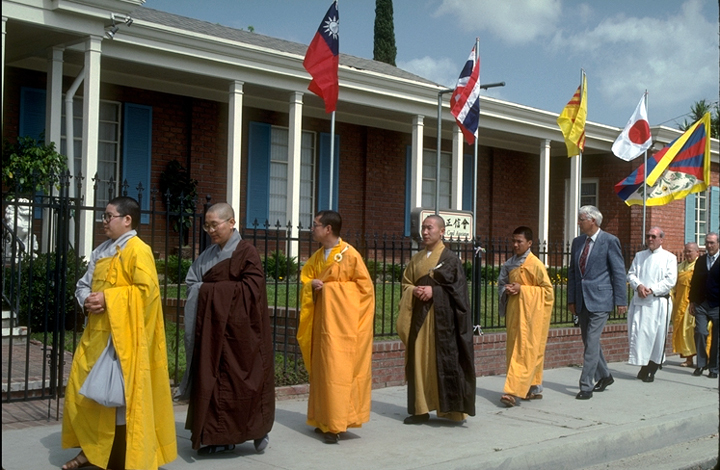 There are also representatives of the distinctively home-grown American Buddhist communities which have roots in the Asian schools, such as the Zen Center of Los Angeles, the Dharmadhatu Center, and the International Buddhist Meditation Center. 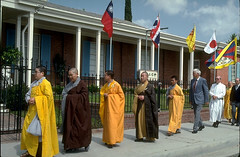 The Sangha Council of Southern California is but one of a growing number of pan-Buddhist councils. In the Chicago area, the Buddhist Council of the Midwest was established in 1978, gathering twenty-eight Chicago-area Buddhist centers from twelve lineages of Buddhism, including traditions from five Theravada countries, four Mahayana countries, Tibet, and the United States. The Council annually hosts a celebration of Vesak (or Visakha). 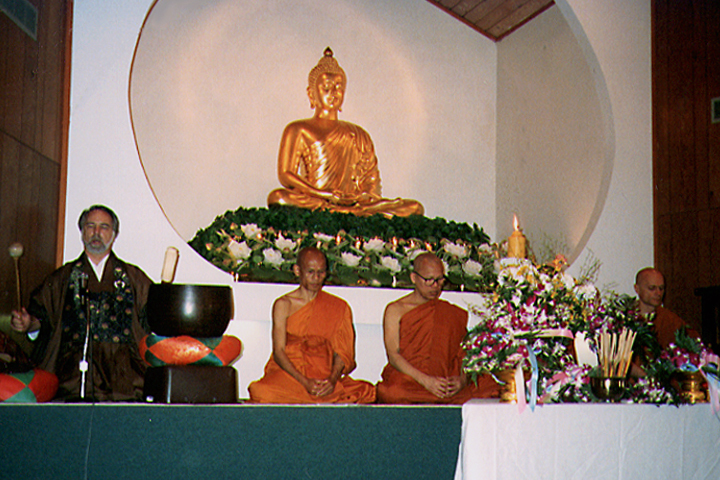 The 2013 festivities were held at the Midwest Buddhist Temple in Chicago and marked twenty-nine years of the collaboration. There is also the Texas Buddhist Association based in Houston, the Buddhist Council of Northern California based in Berkeley, and the Pacific Northwest Buddhist Association in Washington and Oregon. This “ecumenical” Buddhism which, literally, gathers the whole world of Buddhists, is distinctive to the American scene. Korean monks in their grey robes, Tibetan monks in deep red, Thai monks in bright saffron, new American Buddhist leaders and teachers in their jeans, skirts, and business suits—all these Buddhists not only dress in distinctive ways, but also cherish distinctive scriptural traditions, chant in their different languages and styles, and explain the teachings of the Buddha in differing ways. The first step is, quite simply, getting to know one another. While many pan-Buddhist observances such as Vesak have a somewhat formal structure, the sharing they represent may be the seedbed of a quiet Buddhist revolution. The document ends by affirming that it is both “necessary and timely” for Buddhists to come together in forming the American Buddhist Congress. In the summer of 1987, a conference on “World Buddhism in North America” was convened in Ann Arbor, Michigan, bringing together scholars of Buddhism and the leaders of the various American Buddhist communities to discuss the challenges facing Buddhism in North America. It was a wide and distinguished gathering of both Asian-born and American-born Buddhists—all now directing their energy toward Buddhist life in the American context. For eight days they met in a huge tent pitched in the garden of the Zen Buddhist Temple in Ann Arbor. How will they all relate to one another? What forms of education and culture will be appropriate in the American context? How will Buddhism change America, and how will America change Buddhism? How does the Buddhism taught by non-practitioners in Buddhist Studies courses relate to the Buddhism taught by those who have received teaching transmission in one or another lineage of Buddhism? What about monks and laity? Women and men? These are the questions this assemblage discussed. The “answers” are still, over twenty-five years later, in the making. The Buddhist traditions of Asia have now truly spread to America. Many of the new teachers are householders, laity. Many are women. And, interestingly, some of the new generation of American-born teachers have received training and teaching transmission from more than one lineage. A Zen teacher extends his or her training with a Tibetan lama. A Vipassana teacher chants Pure Land sutras. The “braiding” and intermingling of the many streams of Buddhism has begun in America, and a distinctively “American” Buddhism is being born. However, these new American Buddhists have also recognized that getting to know their new Buddhist neighbors is not enough. It is also important to interact with and try to understand non-Buddhists as well. The dominant religion in the United States being Christianity, most Buddhist interfaith work has revolved around Buddhist-Christian dialogue. Starting in 1987, Buddhist-Christian Studies became the official academic journal of the Society for Buddhist-Christian Studies based at the University of Hawaii, creating a central location for articles, book reviews, announcements, and all things related to Buddhist-Christian interfaith work. One specific aspect of this exchange has been Buddhist-Christian monastic dialogue, originally encouraged by Trappist monk Thomas Merton, occurs on a semi-regular basis. In 1996, Tibetan, Zen, Theravada, Roman Catholic and other Christian monastics and teachers came together to engage across traditions. They gathered at Gethsemani Abbey in Kentucky, the late Merton’s home community. There is also substantial Buddhist-Jewish dialogue due to the number of people with a Jewish background who have taken an interest in Buddhism, such as Allen Ginsberg, Joseph Goldstein, and Sharon Salzberg. Interestingly, the term Jewbu has increased in popularity since the 1960s to describe Jews among Buddhist communities. This Buddhist-Jewish dialogue has centered around the questions of what Judaism has to offer Buddhism, what Buddhism has to offer Judaism, and what it means to be a Jewish Buddhist. As America’s and individuals’ multi-religious identities are increasingly explored and Buddhist outreach efforts increase, Buddhists will continue to be integral parts of interfaith groups and initiatives across the nation.